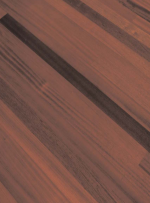 Tropical hardwoods come mainly from South America and ideally suited to a wooden floor. Jatoba (Rode Locus) is a hardwood species from Brazil. The heartwood is flesh-coloured, darkening off to reddish-brown, often with darker stripes. Jatoba is very hard and so ideally suited as a wooden floor. The wood finishes off very smooth. Curupixa originates mainly from the Guyana’s and the Amazon area. Curupixa comes under the so-called exotic wood species and has a reddish-brown, even colour. The floor has an austere appearance. Merbau (Intsia bijuga) is an exotic species of wood with a luxurious look. The boards are brown to dark brown or dark red/brown in colour. Merbau is characterised by the black markings in the wood that occur randomly. When exposed to sunlight the colour differences in Merbau largely disappear and becomes more uniform in colour.